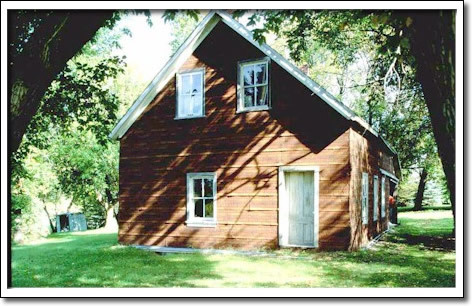 The land upon which this little log house sits was used between 1840 and 1862 as a wood lot by John Cox. Mr. Cox had retired in 1836 to this area of the Red River Settlement after a career with the Hudson's Bay Company as a boatman and labourer. Along with his wife Nancy (Taylor) and other retired HBC families, they formed a tight community far from the supposed wild influences of Upper Fort Garry, 20 kilometres to the south. In 1862 the elder Cox granted his son Robert the land after Robert's marriage to Mary Sanderson, a local girl. Robert and Mary operated a small mixed farm operation and other family members farmed the land until the mid-1970s. The old house was occupied until then as well. The former Cox House is of Red River frame construction. That distinctive procedure involved the creation of a framework of vertical logs and then the placement of short horizontal logs into the spaces. Once the most common construction technique used to erect buildings in Manitoba, examples of this kind of building are now very rare. And a building associated with the common folk, like the former Cox House, is even rarer.